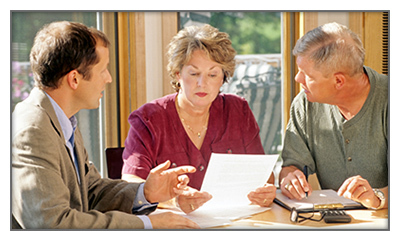 Pre-Arrangement ... A Vital Part of Estate Planning. Michael Johnson is a licensed funeral director with many years of experience in funeral service. His role is to guide you and your family in making informed decisions about advance planning. He will be glad to help in qualifying for Medicaid "spend downs" as well as other options in protecting your family and your assets. For a free consultation or an appointment in any of the communities we serve, please feel free to contact Mike directly at johnsonfamilyfh@qwestoffice.net or by calling our Stuart office at (515) 523-1200. Today more people recognize how planning their arrangements in advance is important part of estate planning. There are several good reasons to plan in advance. First, this thoughtful act reduces the stress of indecision and uncertainty on the part of survivors when a death occurs. Secondly, there may be no one who is capable of making decisions on a person's behalf. Furthermore, if you choose to pre-pay, there is peace of mind knowing funds will be adequate to cover final expenses. Pre-funding is also essential when applying for SSI / Medicaid benefits. Most importantly, prearrangement allows open discussion and rational decisions to be made ahead of time. Fill out our preplanninq form to begin preplanning now, or feel free to contact us for an appointment with our pre-arrangement specialist or one of our funeral directors. Choose a reputable funeral company with a solid track record in the community. Consider the needs of the living. Your thoughtfulness enables survivors to participate in a meaningful final tribute that helps them grieve and gives them comfort. Like any contract, before signing, read it carefully and make sure you understand all the provisions. Ask questions. Keep a copy of your plan in a safe place. lnform a close family member or friend that you have made arrangements and where the documents are kept. Pre-funded arrangements may be transferred for any reason from any funeral provider, where previously made, to Johnson Family Funeral Home.